The Feast of Christ the King is a relatively recent one, instituted by Pope Pius XI in 1925 with the promulgation of the Encyclical, Quas Primas. The immediate peril facing the Church as the Holy Father wrote was spiritual in nature, manifesting itself in the temporal order through an increasingly secularized society. The relegation of Christ’s authority to the periphery was an effrontery centuries in the making – from the Protestant revolt and the French Revolution, to the rise of pluralistic democracies (like the United States) and the decline of Catholic Monarchies. Even so, it can be said with confidence that Pope Pius XI was a man of great vision, who saw in this terrible regression a pressing need to call mankind, with all the more fervor, to assemble beneath the banner of Christ the King to proclaim and promote His Sovereign rights and prerogatives. 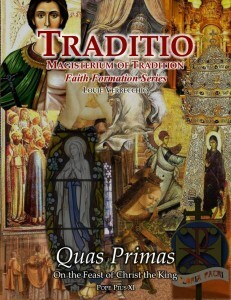 Therein lies the purpose of Quas Primas and the most excellent feast it established.